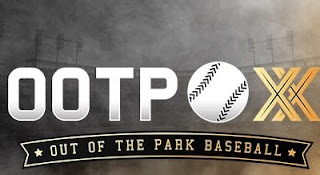 Today is a huge day as Out of the Park Baseball 20 is officially released. As many of you know, this blog loves Out of the Park Baseball. We use it for our Red Sox Replay Seasons and all the other historical projects we have done and written about. Brad Cook and Markus Heinsohn have been really good to us over the years and once again have sent us two copies of the game and we are going to give one of them away. So how can you win yourself a copy of this year's historic edition of Out of the Park Baseball? It is real simple and it's going to cater to those of you who are fans of the history of baseball and baseball simulation games. We run another blog called Retro Baseball which strictly is about historical simulations using Out of the Park Baseball. Currently we are simulation the 1964 season. We recently launched the blog and not many people know about it. So the contest is real simple, we are going do a random drawing of everyone who follows the Retro Baseball Twitter page and the Retro Baseball Facebook page. How easy is that? We will do the random drawing at some point this weekend. Good luck to everyone. We need to get back to playing Out of the Park Baseball 20 now. Just wondering, did anyone win?